Per fess Or and sable, three pine trees couped vert and a griffin sejant contourny reguardant Or, all within a bordure counterchanged. Maîtresse Melisande of the Gryphon Wood is a bit of a dilettante, having tried many arts and sciences and holding various offices. She has lived in several Kingdoms --even if only for three months at a time-- but calls the East her home. She is currently married to Master Jonathan Blaecstan and lives with him and their 4 cats when not Out On The Road&#0153;. 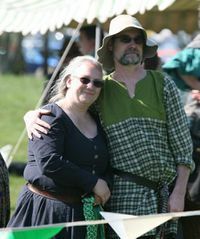 Melisande of the Gryphon Wood is a 12th Century Norman who escaped to the Holy Land to avoid an unwanted marriage. Her travels, voluntary and in-, led her across much of the Silk Road with the result she was in Samarkand when it was sacked by Genghis Khan. She stayed among the Mongol Horde for a number of years before returning home to reclaim her family's land. She has taken all she learned among the various cultures and has become the One Your Mothers Warned You Of™, much to her great delight. She is hoping to travel to England soon, as she hears the Queen Mother has some interesting ideas on the place of women in Court. She has taught Illumination 101 during her stay in the Kingdom of An Tir, Principality of the Summits, and is developing a series of Illumination classes called "Not As Hard As It Looks", the first of which (Italian White Vine) was beta-tested at Aethelmearc's Pen vs Sword III: Cloak and Dagger event. This page was last edited on 7 February 2017, at 13:04.